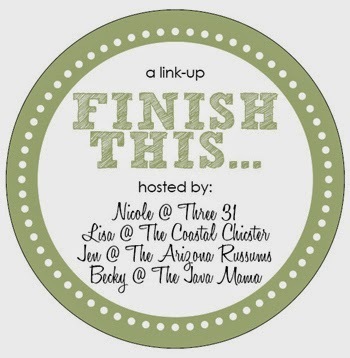 I'm joining a "Finish This" link-up! Not sure what a link up is? Don't fret. I've been blogging for a long time now and am still behind the times... basically a blogger hosts a link up and other bloggers write about the same topic. See the hosts below! If you were God and couldn't be seen or heard, how would you communicate? It describes coincidences as "God Winks" and the power it has in your life. It's wayyy better than my description but it's a book I continuously refer to and talk about. It's been such a profound book for me! 3. My favorite TV show is …Amazing Race. Hands down. MVP and I have auditioned THREE TIMES and have yet to be picked. We ain't giving up! We are obsessed (and think we would totally ROCK IT!). We use it as a date night; put the baby to sleep, cozy up on the couch, and intensely watch. We talk about what we would have done, which challenges we would do, and of course, which couples we are rooting for. WE LOVE IT! And, we love seeing some places we've been! 4. The most spontaneous thing I’ve ever done is …Oh heavens. I'm not good at MANY things but spontaneity is not one of them. I feel I'm tamed a bit over the last few years but seriously, I thrive off being spontaneous! Skydiving over Mt. Kilimanjaro. Taking my boyfriend (now MVP!) on a blindfolded surprise beach camping trip. Scaling the wall of my former middle school to have a burrito picnic on the roof. Waking up in Thailand and deciding to spoon with HUGE tigers! Safe spontaneity is the biggest A+ in my book. 5. I prefer DOGS/CATS because …Dogs. Cats are pretty but have no personality. Also, we had a childhood cat and she was EVIL. Is this a real question? 6. I met my significant other …In Elementary school. Yep. We went to the same elementary, middle, and high school but never dated until college. Different colleges, too! How did we reconnect? Um...it may or may not have been one of those "spontaneous" summer nights that included spin-the-bottle and one too many Coronas. You wanted honesty, right? (FYI it was the first time I had ever played spin-the-bottle!) We were young kids and both were determined to have a secret summer fling. Yes, SECRET. Welp, the secrecy just about sealed the deal because our summer fun quickly turned into a long distance love story! Our relationship started with FUN and we till death do us part we hope to continue the party!